INTERNATIONAL LOGISTICS, INC. RECEIVES PRESIDENTIAL AWARD FOR EXPORT SERVICE Omaha, NE — U.S. Secretary of Commerce Penny Pritzker today presented International Logistics, Inc. with the President’s “E” Star Award for Export Service at a ceremony in Washington, DC. The President’s “E” Star Award is the highest recognition any U.S. entity can receive for making a significant contribution to the expansion of U.S. exports and is awarded to companies for superior performance in increasing or promoting exports. Only previous recipients of the “E” Award are eligible. International Logistics, Inc. received the President’s “E” Award for Export Service in 2012. “International Logistics has demonstrated a sustained commitment to export expansion. The “E” Awards Committee was very impressed with International Logistics’ dedication to serving customers in more than 85 countries. The company’s innovative problem solving to provide more efficient and cost effective logistics solutions for its customers was also particularly notable. International Logistics’ achievements have undoubtedly contributed to national export expansion efforts that support the U.S. economy and create American jobs.” said Secretary Pritzker in her congratulatory letter to the company announcing its selection as an award recipient. International Logistics, Inc. (ILI), a subsidiary of TSL Companies headquartered in Omaha, Nebraska. International Logistics, Inc. is a global supply chain solution provider and an expert in developing distribution solutions that are flexible and specific to the needs of the customer at competitive rates. In 1961, President Kennedy signed an executive order reviving the World War II “E” symbol of excellence to honor and provide recognition to America's exporters. 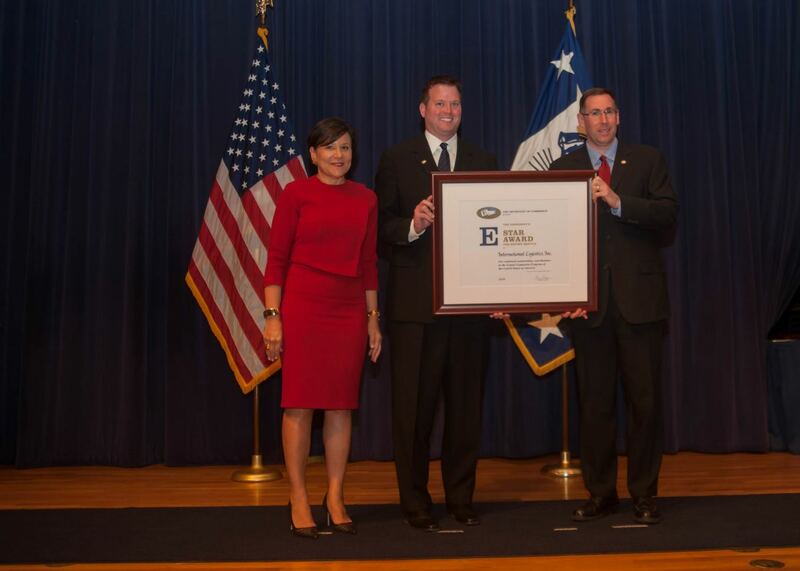 Today, Secretary Pritzker honored 123 U.S. companies with the President’s “E” Award for their outstanding work to reduce barriers to foreign markets and to open the door to more trade around the world. “These companies demonstrate the opportunity inherent in selling Made-in-America products to the broad customer base that exists outside our borders. Their success contributes to growth, job creation, competitiveness, and the success of the American economy.” In 2015, U.S. exports totaled $2.23 trillion, accounting for nearly 13 percent of U.S. GDP. Nationally, exports contributed to the U.S. economy, supporting an estimated 11.5 million jobs. U.S. companies are nominated for the “E” Awards through the Department of Commerce’s U.S. Commercial Service office network, located within the Department’s International Trade Administration, with offices in 108 U.S. cities and more than 70 countries. Criteria for the award is based on four years of successive export growth and case studies which demonstrate valuable support to exporters resulting in increased exports for the company’s clients. With more than 100 offices worldwide, International Logistics, Inc., based in Omaha, Neb., provides cost-effective distribution solutions between more than 85 countries. ILI’s parent company, TSL Companies, was founded in 1981. It now has terminals in Omaha, Kansas City, Dallas, and Denver, and holds the honor of the largest international intermodal trucking company between the Mississippi and the Rockies in the upper 14 Plains states. The company’s slogan is “One call does it all.” In other words, Hastings says, “We move a shipment from origin to destination, meeting all requirements in between. When we go to a customer, we are selling the entire package from depots, to drayage to freight forwarding and more. We haul anything and everything, anywhere and everywhere.” Thomas Hastings knows the trucking traditions of Nebraska quite well; he grew up in the culture. “I am steeped in the spirit of the transportation business,” he says. “I’ve been around it my entire life. My dad ran a small trucking company in northeast Nebraska, and I started driving semi for him at 16 years old.” Moreover, he says, the company has devoted itself to understanding and developing expertise in the international logistics chain, reaching locations much further away from home. Other TSL divisions include Transportation Specialists, Ltd., Transpec Leasing, TSL Terminals, and TSL Logistics.